Buy multiple sets of 10 for 10% Discount. 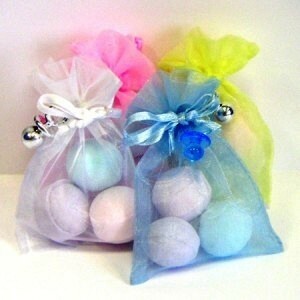 Trio of Bath Bombs in Shimmery Organza Bags with Charm are the perfect Baby Shower Party Favour or Prize for your Games & a real favourite. These are truly gorgeous & loved by all! £1.80 per bag containing 3 bath bombs. These pretty organza bags will be loved by all your guests as they are so pretty and smell divine. Each bag is filled with 3 beautiful scented bath bombs - Baby Talc (and we all love the smell of that! ), Relaxing lavender & Ocean breeze. Each bag is then tied and finished with a dummy charm. Your guests will love these as a treat for their bath or lovely pomander for their drawer. You could give these to each guest as a favour or give to the winners of your party games. Make these extra special by attaching a personalised label to each. You can choose from pastel pink, pastel blue, yellow, white, lilac, hot pink, orange or indeed a mixture of organza bags. 'The bath bombs are GORGEOUS, I'd really highlight them on the site' Thanks Ashling.